Having personal goals is great for motivation; whether it’s to lose ten kilos before the summer or race in your first marathon, goals give us a tangible target to aim for. But to really see progress, it’s important to break your goals down into smaller more manageable chunks, and reward yourself each time you reach a target in your exercise plan. Many people keep a training log or journal as a way to track progress in their exercise routine. It is also a great motivator on the days when you are not feeling like sticking to the exercise plan. A fitness journal will remind you of your efforts to date and encourage you to not let all that valuable time and energy you’ve put in go to waste. 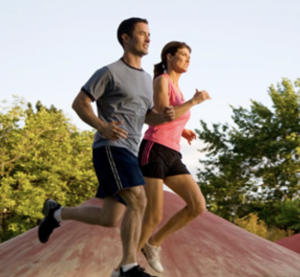 Having a partner to join you in your exercise routine is a fantastic motivator. It’s more fun to workout with a friend, they often help to push you, and on days when you just don’t feel like sticking to the exercise plan, it’s much harder to bail out knowing that someone else is depending on you. If you enjoy listening to music, using it as part of your exercise routine can be a huge boost. Research has shown that listening to music while exercising can help you push harder and enjoy your workout more. With all of the great technology and portable gadgets available today, there are dozens of options to play music during your exercise routine. Create your own fitness playlist and tune in to whatever sounds get you moving. One of the great secrets elite athletes use is visualising themselves achieving success, winning races, etc. Their mind then directs their behavior towards achieving those goals. Picture yourself the way you want to be – how you’ll look when you’ve lost ten kilos, how it feels to finish your first marathon, and so on. Visualise this when you wake up in the morning, throughout the day, and just before you fall asleep at night. By training your body through the mind, you’ll soon be on your way to achieving your vision. You wake up, you get dressed, you eat, you go to work, you exercise. Training Tip 7: Don’t Feel Guilty! If you miss a workout, don’t stress out – it happens to everyone. We all lead busy lives and sometimes have higher priorities to deal with on a given day. Simply get back into your exercise program the next day or as soon as you can. However, if you find yourself regularly missing days in your exercise routine, then take a step back to figure out why: Are the times inconvenient? Have you set unrealistic goals? Have you chosen fitness activities you really don’t enjoy? Sometimes a simple change to your exercise plan is all it takes to get you back on track with your exercise routine. It’s common for even the most active people to get bored with their chosen fitness activity. Putting some variety in your exercise plan not only makes it more fun, but also works different parts of the body so you progress faster. Do a variety of workouts and activities to keep your mind and your body fresh. Who would have guessed the Spice Girls were actually giving medical advice when they sang ‘Spice Up Your Life’? Training Tip 9: Do Something – Anything! Every little bit helps, so even if you don’t have time for an hour’s workout at the end of the day, you can find ways to fit things in throughout the day: Walk or bike to work, take the stairs instead of the elevator, stretch at your desk, have a ten minute ‘dance break’ with a colleague when others are having a ‘smoko’ etc. If your goal is to exercise at least three times per week, just remember that even going twice a week is infinitely better than not going at all. 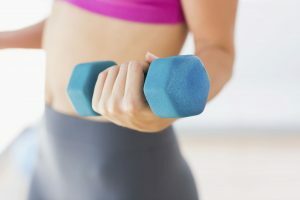 Finding the perfect balance of what you enjoy, what gives you the best health benefits and puts the least amount of wear-and-tear on your body, is the goal of your exercise plan. And staying excited and motivated to be healthy is the key to making it all happen. The human body was designed for movement – now get out there and start moving!